SUNRISE, Fla. (AP) -Karlis Skrastins wasn't planning to shoot from the blue line until he heard an encouraging yell from a teammate. 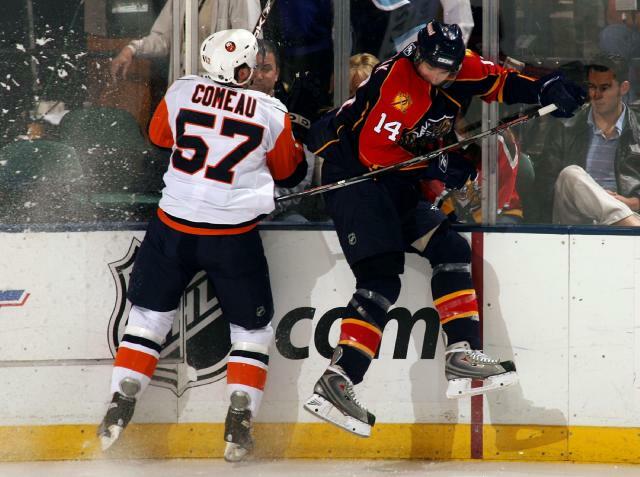 The result was another winning goal for the Florida Panthers. Skrastins' second goal of the season 8:22 into the third period broke a tie and led the streaking Panthers to a 4-2 victory over the slumping New York Islanders on Wednesday night. Skrastins stopped the Islanders' clearing attempt at the blue line and then fired a slap shot that beat Rick DiPietro to the far side after the goalie was screened by New York defenseman Matthew Spiller. "I was just thinking about getting the puck back in the corner, but somebody yelled to me that I had a little bit of time, so I took my time," Skrastins said. "I was thinking maybe to pass over to (Jay Bouwmeester), but I just shot and it was a good shot." Skrastins, acquired from Colorado last month at the trade deadline, scored his first goal for the Panthers. He has 23 goals in 589 career games, and six were game-winners. "It's great to see a guy like that score a goal like that," Florida defenseman Bryan Allen said. "Ever since he's come in here, he's a guy that battles every night and sacrifices his body and does whatever he can to help the team. It's nice to see a guy like that get rewarded once in a while." The Panthers won their season-high fifth straight game. Florida won all four meetings between the teams, completing its first season sweep of the Islanders since the Panthers' inaugural season in 1993-94. Kamil Kreps and Stephen Weiss also scored for the Panthers, who moved within five points of eighth-place Philadelphia in the Eastern Conference playoff race. Brett McLean added an empty-net goal. Florida has 74 points and is tied for 10th in the conference with Southeast Division-rival Washington. Bill Guerin and Blake Comeau scored for the Islanders, who have lost six of seven and sunk to 13th in the Eastern Conference. 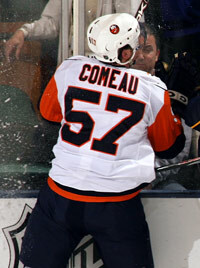 "To be how close we were a few weeks ago and to be where we are now is frustrating," Comeau said. "Until we're mathematically out, the guys in this room are going to keep pushing hard. Nobody is ready to lay down and die yet. We've got a great attitude in this room." This was Florida's second victory over the Islanders in 10 days. The Panthers recorded a 1-0 road win on March 2 when backup Craig Anderson stopped 53 shots. Tomas Vokoun was in net for Florida this time and made 27 saves. Vokoun was particularly impressive early while the Islanders were outshooting Florida 10-1 in the first eight minutes. "This game wasn't so good for us at the beginning," Skrastins said. "The only guy who played well was Volky. He kept us in the game." DiPietro stopped 28 shots for the Islanders. Weiss broke a 1-1 tie at 1:05 of the third period when his rebound shot from a sharp angle went off DiPietro's pad and landed behind him. Comeau tied it at 7:18 with a power-play goal. He scored to the glove side with a wrist shot from the slot. After a scoreless first period, the teams traded goals in the first 1:23 of the second. Guerin gave the Islanders the lead 28 seconds in when he tapped home a pass from Richard Park on a 2-on-1. Kreps tied it 55 seconds later after taking a feed from Ville Peltonen on another 2-on-1. "We got a goal, and then two shifts later give it back to them," Guerin said. "It's tough." Notes: The Islanders fell to 9-5-1 in the second of back-to-back games this season. ... Islanders LW Ruslan Fedotenko sat out after injuring a knee in the third period of Tuesday's loss at Tampa Bay. ... Florida RW Nathan Horton extended his point streak to six games with an assist on McLean's goal. ... Five of the Panthers' previous eight home games had gone to overtime.